Today’s ever-expanding electronics industry is continuously bridging the gap between fiction and reality by bringing forth new sophisticated technologies and developments. Computers and other electronic equipment use small voltages and low currents to perform their functions. When minute layers of corrosion build upon circuit surfaces, they increase electrical resistance and decrease capacitance, which can seriously effect calibration and performance. When electrical equipment is rapidly cooled and heated (such as when cold aircraft descend into warm, humid airports) there is a potential for condensation and corrosion. 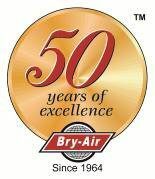 Bry-Air, Inc. dehumidifiers prevent these problems, saving calibration time and improving the mean time between failures of electronic systems. In general, dehumidification systems can be applied in the manufacture, processing, storage and operation of electronic and electrical systems and components. In the production of semiconductors and integrated circuits, excessive moisture can adversely affect the bonding process and increase overall defects. Photo sensitive polymer compounds called photoresists are applied to surfaces in order to selectively protect them during the etching process. For best adhesion, clean photo lithography rooms are kept between 20% and 35% relative humidity and 70°F. Excessive moisture causes adhesion failures, stress fractures and surface defects. In the manufacture of hybrid, a series of integrated circuits are adhered to an alumina substrate. For best adhesion, clean rooms are generally maintained at 20% to 35% relative humidity and 70° F. Moisture control is absolutely essential when quartz crystals are incorporated with printed circuit boards. The quartz crystal boards, after assembly, are put through an aging process during which time the humidity levels must be carefully controlled in order to prevent the crystal from adsorbing water vapor. In the manufacture of high voltage cable wrapping with paper strips, it is very essential that the humidity level is controlled as moisture trapped between the insulation and the conductor can cause shorting, explosions and discharge due to the breakdown of the electrical insulation. Recommended conditions are 5% relative humidity at 65-70°F. In most cases the insulation, such as yarn or paper, absorbs moisture; hence, the need to maintain low humidity levels is essential. The conditions maintained in the “White Room”, an area where the temperature, humidity and dust particles are controlled, is normally 35% to 40%RH and 72°F. In the manufacture of open ended glass television and fluorescent lighting tubes, the inner surface is coated by allowing slurry to wash down the inside of the tube. The tubes are then transferred to a drying oven where the coating is allowed to bake and harden. The tubes are then removed from the oven and allowed to cool. During this cooling period moisture causes imperfections to develop in the coating and a quality problem arises. 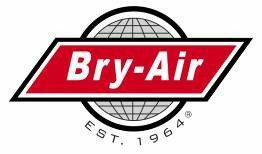 By forcing dry, cool air through the tubes after they are taken from the oven, the quality problem can be eliminated. The recommended conditions for this process are 10% relative humidity and 95° F.
Lithium is the metal utilized in most modern batteries and it oxidizes very easily in the presence of moisture. The relative humidity must be reduced to 1% during the period of the manufacturing process in which the metal is exposed to the ambient air conditions. Precision components and sophisticated electronic components such as microchips VLSI’s and IC’s require cleanrooms for manufacturing a high-quality product. A cleanroom is a specially constructed enclosed area which is environmentally controlled with respect to airborne particulates, temperature, humidity, air pressure, air- flow pattern and lighting. Dehumidification equipment is an essential part of the total environmental control in the cleanroom. In most cases, the presence of moisture is a deterrent or results in abnormally high maintenance of electrical and mechanical operating devices. For instance, a good example is a telephone exchange in which thousands of electrical relays are subject to constant pitting because of excessive arcing under high humidity conditions. The presence of water vapor may also corrode the contact points of infrequently operated electrical contractors, sometimes to the extent that poor closure of electrical circuits may result. Electronic equipment in such places as radar stations or electrical switching systems are subject to loss of efficiency and high maintenance costs when exposed to humid conditions. 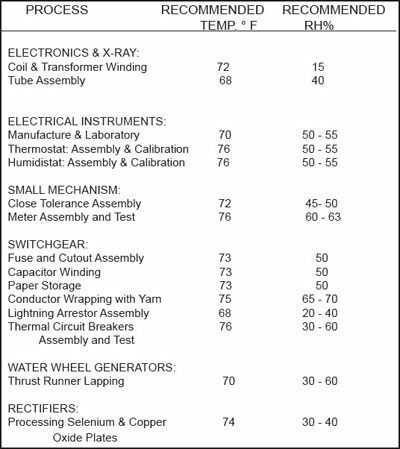 Whether it is telecommunication data processing or defense or aerospace industries, the control of humidity and temperature is a critical component for the manufacture and operation of sophisticated electronic technologies.